Are PR agencies ready to rule web 2.0? Swedish companies invest 288 million kronor (45.5 million USD) per year in social media campaigns. Well, actually they don’t. But it is an intriguing thought, if they did. According to a survey by Coremetrics called ‘Face of the New Marketer’, US marketing professionals spend 7.8 percent of their online marketing efforts on social media campaigns in Q3 2007.
a) How long will it take for us to get there? 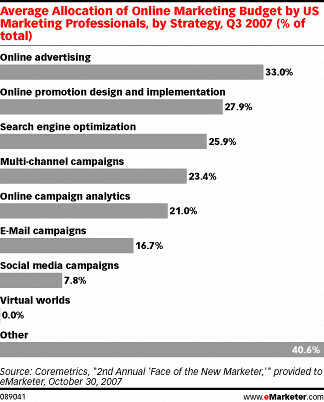 b) What will drive marketing professionals to spend on social media? c) What type of consultants will capture the lion’s share of the spending? c) I am convinced that PR agencies could be in the driver seat when it comes to social media. Dagens Media’s editor in chief Rolf van den Brink asks this week whether PR agencies in Sweden are ready to handle the social media landscape. And while I think many agencies lack deeper knowledge about web 2.0, I disagree that advertising agencies should be better suited than PR agencies to tackle relations directly with customers. PR agencies are used to managing relations with different audiences and to deal with messages that aren’t directly in your control. Previously you needed to communicate via gatekeepers (read: journalists) that could distort, praise or ignore your message. In social media, your message is in the hands of the consumers. If any consultant would be able to advise clients on communicating in a transparent, chaotic, conversational media landscape, then it should be PR agencies. I don’t see advertising agencies excel in two way communication, do you? – PR agencies are good at assessing news value, which will also be relevant in new media. – PR agencies are experts on producing content, which can drive the conversation. But that’s in theory. How it is in practice, is a completely different ball game. Some agencies are already working with these matters, while others are many steps behind. So, who’s ready to make 288 million kronor? Tags: social media, public relations, public relations, pr, sociala medier. Ping.